My apologies for not having amounts but it's a salad - do things according to your own taste. 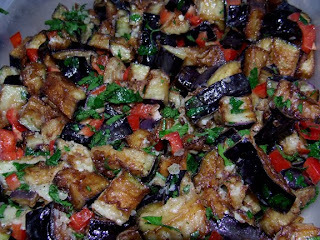 Dredge the eggplant in the flour, shake off excess flour and fry the pieces until golden brown, turning at least once. Drain on a towel then place into a bowl. Add the rest of the ingredients, toss and chill. * I have since dispensed with frying and only bake the eggplant. After dredging in the seasoned flour, place on a cookie sheet, toss with some oil, and bake until golden brown.